From luxury hotel destinations to the best spots for a quick-fix manicure, we’ve rounded up the best spas in London in each area to make booking your next urban retreat or beauty treatment effortless. If you haven’t yet heard of this new city hotspot, it’s time to put it on your radar. 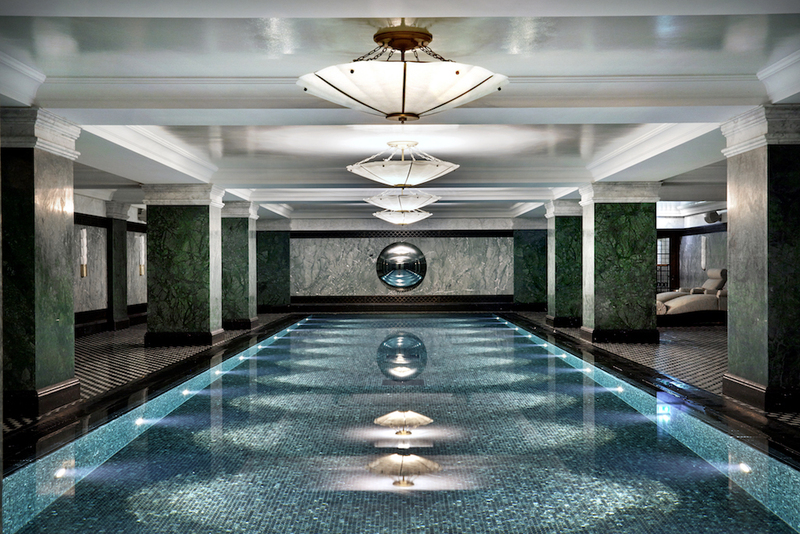 Not just a hotel and members club, The Ned also has a luxury spa that boasts a sauna, steam room and swimming pool and is set in the most opulent of interiors. Alongside the Cowshed spa, there’s the Cheeky nail bar, a Miguel Perez hairdresser, the speakeasy-style Ned’s Barbershop, and the Trish McEvoy shop, a beauty destination that offers makeovers and lessons. This impressive establishment has certainly executed its plan to perfection. Book in for a quick fix, or spend the day there for the ultimate indulgence. Sometimes, you need a place that does one service and does it well. House of Wax in Shoreditch does exactly what it says, and there’s no time-wasted here. The idea is that you should be able to fit a quick wax into your already-busy schedule, so the salon is open after hours and is equipped for lunchtime appointments. One of the more reasonably priced places in the centre of town, a bikini wax comes in at just £30; perfect for regular customers or those saving their pennies for that bikini-based retreat. Those on the lookout for an eco-friendly hair salon that doesn’t compromise on quality, look no further than Ralph and Rice in East London. Contemporary in its branding, it’s a one-of-a-kind destination with a welcoming atmosphere and a moral business model. Why not try booking in for Flamboyage? A fusion of balayage and ombre, it’s loved for the natural-look and being low-maintenance. Alternatively, ask the knowledgeable staff for advice, and they’ll tailor a bespoke hair treatment to your personal needs. There’s a personable atmosphere at The Shoreditch Spa. Instead of magazines, guests are offered tablets and a complimentary glass of Prosecco. Combine this with the boutique setting, and it’s our number one choice for a pamper session with friends. Get a mani-pedi upstairs and then head downstairs for some relaxation with a massage, facial or body treatment in the slightly more tranquil setting. Just off Shoreditch High Street, it’s a welcoming space with a modern-day approach. On the ground floor of Shoreditch House, Cowshed Spa combines a little luxury with a lot of style. It’s arguably one of the most recognised spa names in London, so it’s perfectly placed in the city’s most famous members club. The treatment menu covers just about everything, from express manicures to more elaborate treatments, such as the 90-minute salt scrub and massage, so whether you’re prepping for an evening out, recovering the day after or simply in need of a little TLC, this is the place for you. A more sociable atmosphere than some of the aforementioned establishments, it’s a great place to book with a friend. You’d be forgiven for not knowing about Montcalm Hotel’s East London location–it’s hidden away near Liverpool Street, but it’s perfect for city workers or those looking for an unrivalled view of the London skyline away from the tourist hotspots. The spa couldn’t feel farther from the urban jungle outside. Delightfully tranquil with an opulent treatment menu, it’s the perfect place to de-stress. Beauty and Melody offers 30-minute capsule ritual treatments for a lunchtime pick-me-up or to trial their services. Alternatively, book something more indulgent, such as the Thalgo Indocane Spa Ritual, a 90-minute treatment that includes a foot treatment, body exfoliation, massage and a body wrap. It’s the interiors that set Mie Mani apart, as it’s bedecked in opulent mirrors, fringed curtains and richly coloured paintings. The place to go if you’re looking for a complete hair restyle or something a little radical, the specialist hair technicians are experts and will ensure you feel comfortable every step of the way. Mie Mani also offers a range of exclusive treatment services, including the Biolustré hair repair system. The epitome of a hidden gem, The Spa in Dolphin Square is a short walk from Pimlico station, but the minute you step inside, you’re transported to Morocco. Interiors are themed accordingly and feature rich colours, textures and subtle candle lighting. Alongside your booked treatment, traditional heat facilities are also on offer, from hammam and Rhassoul to a salt steam room. Book in for something simple, such as a spray tan or pedicure, or indulge in one of the specialist Moroccan body treatments for a truly authentic experience. Initially based exclusively in Covent Garden, Pure Synergie is now also in affluent Greenwich and is a popular choice for those looking for spa treatments at affordable prices. A deep tissue massage comes in at around £60 for 60 minutes, and a bikini wax at (an almost unbeatable) £15. Pure Synergie also recently launched extensive detox cleanse programs, which include colonic irrigation treatments and day detox cleanses designed to help your body reset. Each boasts a plethora of health benefits, which are outlined here. My Detox Diet in Greenwich is not only a health food shop, it’s also home to a full spa that offers a holistic approach to well-being. Experienced therapists are trained in everything from cleansing Dermalogica facials and the anti-aging Diamond Microdermabrasion to colon hydrotherapy. All of it contributes to maintaining a healthy body and mind. The spa is also among the few places in London with an Iyashi Dôme, a revolutionary organic-based infrared therapy that produces perspiration to eliminate toxins. All treatments go hand-in-hand with specially tailored juice cleanses, resulting in a truly well-rounded approach to healthy living. Ayurveda is an ancient Indian holistic health system based on achieving physical and mental harmony, and Ayurveda Pura in Greenwich follows this science and all that it offers. The spa has a yoga studio and a health café. Everything from the food to the treatments are designed to strengthen the immune system, remove toxins and rejuvenate the internal system. Alongside the classic salon and spa experiences, they also offer a variety of personalised detox program that cover nutrition, massage and detox treatments. House of Elemis is an extension of the established luxury skincare brand, ELEMIS. The spa is a place for escapism and offers a bespoke experience. Each treatment is designed to support skin health, and each spa therapy is adapted in response to what the client wishes to get out of it. The BIOTEC facial treatment comes highly recommended; the innovative machine works to increase the skin’s natural cellular energy and results in energised and healthy-looking skin. The Aveda Institute in Covent Garden is the salon on every beauty editor’s radar at the moment. Offering a complete brand experience with an extensive treatment list, the mission is to remain environmentally responsible and create treatments and experiences that use only plant-based products. Even the interior has been designed using responsible materials, and every service reflects this goal, from express facials and hair conditioning treatments to the most intensive 135-minute Top To Toe Experience (an aroma body polish; back, neck and shoulder massage; a manicure; and a pedicure). Bedecked in white marble and boasting a sleek lap pool, hammam, sauna, Jacuzzi and nine treatment rooms, Akasha feels worlds away from the madness of Piccadilly Circus. An all-round spa experience, the calming atmosphere, specialist treatment menu and focus on personal well-being is the full package. Book in for a hydrotherapy session to try something a little different, or make an appointment with one of the in-house wellness experts who offer counselling or nutrition advice. Founded in 2015 by Andrea Pfeffer, who believes that healthy skin is the key to beautiful skin, PfefferSal specialises in facial treatments, including multi-vitamin boosts and bright-eye solutions. This spa has personality and takes a modern approach, with witty treatment taglines and bright interiors that nod to the season’s design trends. Far from pretentious but uncompromising on quality, it’s the branding that really makes this Fitzrovia salon stand out from the crowd. Luxury fashion and lifestyle retailer Harvey Nichols is globally recognised for their premium approach to all-things lifestyle, which makes its in-house spa a hotspot for fans of the brand. Beyond Medispa provides innovative surgical and non-surgical treatments for in a slightly more clinical environment than the other destinations on our list. Whether it’s a classic facial or the Coolsculpting treatment, the results are visible. Don’t forget about the three floors of shopping to pass through on your way down to the exit. You might recognise the name Bamford Haybarn from the spa’s rural location at The Daylesford organic farm, but it brings a touch of the countryside to the city at The Berkeley, a world-famous luxury hotel. Offering a truly British experience and using holistic products, it provides an oasis of calm. Why not try one of the four specially-designed body wraps before heading to the rooftop garden to admire the view of Hyde Park? Ushvani was once voted the U.K.’s best day spa by Tatler and Condé Nast Traveller. It’s easy to see why once you enter the oasis in the centre of Chelsea. With concepts based on ancient Asian culture, the interiors have been designed accordingly. The treatments are holistic, and the rooms are adorned with rich wood panelling and commissioned Malaysian artwork and smell of ginger, nutmeg and pandan leaves. The Malay Massage comes highly recommended for those looking to escape their mind and body for 90 minutes. Step away from the madness of King’s Cross station and into Savant; a modern, beautifully decorated salon offering an unrivalled treatment menu, skilled beauticians and state-of-the-art technology. From non-surgical botox packages to spa pedicures and full-body massage, you can pop in for a quick beauty fix but Culture Trip recommends spending an entire day of rejuvenation here. Book in solo or with a friend – there’s a couple-sized steam room and spacious relaxation areas stocked with magazines and herbal teas, so it’s ideal if you’re looking to unwind without leaving the city. Gary Ingham in Hampstead is an oasis of calm. Everything about this spa is polished, and treatments range from beauty fixes like eyebrow threading and tinting to detoxifying full-body massage. The salon stocks Aveda products, and there is a hair salon downstairs and spa treatment rooms on the first floor. The beauticians are experts in their fields, and there’s something about the overall calming nature of the space that makes you feel instantly at ease. Settings don’t get much more London than Angel Therapy Rooms in Angel/Islington. Set in a Victorian townhouse that highlights the traditional features, it’s a far cry from some of the more modern spa settings in the city. Each treatment space is different, and the interiors are based on the principles of light, air and space, which creates the perfect setting to clear your mind and switch off from the outside world. Services range from therapeutic massage to the bride-to-be pamper, and therapists will tailor each treatment slightly to suit your needs on the day. Banya No.1 in North London is one of the only places in the city where you can find a traditional Russian Bath Spa. The steam in the heated space is wetter and easier to withstand than in a regular sauna, and the overall effects are more hydrating and detoxifying on the body. Treatments are certainly different than those you might find elsewhere, with many concluding with a light hitting with aromatic oak leaves. Unsure? There’s only one way to find out if you like it. Book in for a treatment and enjoy the authentic food and drinks on offer in addition to your spa experience.